Posted on September 25, 2015	by Katy K.
Is there a universe where I could read everything I want to that sounds good? Can I live there, please? It took me longer than I wished to get to these (and many other titles) because there’s so much else out there that’s so much fun! Both of these graphics have been getting a lot of much-deserved attention, and I finally read them! Nimona by Noelle Stevenson. HarperTeen, 2015. Nimona is a young shapeshifter. As the story opens, she knocks on villain Ballister Blackheart’s door saying, “Hi, Boss! The Agency sent me! I’m your new sidekick.” The Agency, of course, had nothing to do with it, but Nimona is insistent on staying, even when Blackheart turns out not to be as evil as she likes. He’s really not interested in killing his nemesis/best friend Sir Goldenloin. 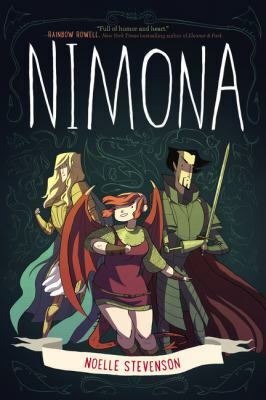 Nimona, though, pushes him to ever bigger deeds of evil, all bent on taking down the Agency – which, as it turns out, has evil plans even bigger than those of the official villains. There is so much to love about this! I’m not usually one for anti-heroes, but Nimona is so innocently enthusiastic about it that I couldn’t help falling for her. She’s also the rare plus-sized protagonist who’s not at all concerned about her weight – as Kelly Jensen pointed out at Book Riot, she’s a shapeshifter: she could choose to be any shape she wants, and this is it. Blackheart, as previously mentioned, is living out the role of villain he’s been cast in, but is really tender and protective in a nice fatherly way towards Nimona, as well as his loyalty to his old friend. The world itself is just as quirky – everyone wears medieval clothes, including armor, and the market looks, well, straight out of the Renn Faire, with high-tech devices side-by-side with the old-fashioned. Blackheart and Nimona relax at night in front of the TV with pop-top beverage cans, and there’s a nice futuristic science fair as well. The art is sketchy-looking lines, faces either round or pointy, filled in with fairly simple colors in an autumn palatte – but the emotions of the characters are all perfectly clear. Highly recommended for anyone old enough to deal with moral ambiguity and some violence– say middle school and up, and definitely including adults. Nimona started life as a webcomic, and you can still read parts of it online. Lumberjanes vol 1. Beware the Kitten Holy. by Noelle Stevenson, Grace Ellis, Brooke Allen, Maarta Laiho, Aubrey Aiese, et al. Boom! Box, 2015. Lumberjanes is an ongoing comic series, which I’m sorry to say is no longer being written by Noelle Stevenson. Though I hope the new writers are able to carry on the torch, if you haven’t read the collected Volume 1 yet, please go out and do it now! 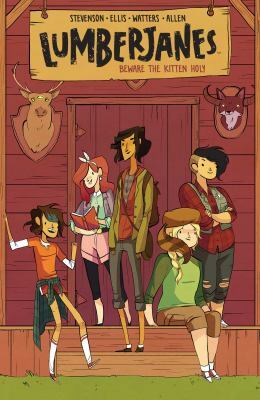 This tells the story of a girls who are attending a camp run by a Girl Scout-like organization called Lumberjanes, whose motto is “Friendship to the Max”. The five girls – Jo, April, Mal, Molly and Ripley – seem to range in age from about nine to their mid-teens, and are diverse in body type, ethnicity, and interests – their styles range from girly-girls to butch and everything in between. Each chapter is named after a badge and opens with a page from the Lumberjanes Field Manual describing how the Lumberjane would go about earning that badge, written in a tone that perfectly echoes the early Girl Scout manuals, back when they were written Juliette Gordon Lowe herself*. The badges, though, are not the practical subjects of actual Scouting. Their titles are so funny that I had to share them all with you: “Up All Night,” “Naval Gauging,” “Everything under the Sum,” “Robyn Hood,” and “Pungeon Master.” And the adventures the girls have involve strange supernatural occurrences, on top of the more stereotypical cabin camping experience. This was tons of fun, magnified for me by my own Girl Scouting experience. But one needn’t be a Girl Scout or even female to enjoy this – everyone in my family from the five-year-old (OK, she just turned six, but she was five) to my love ate it up. The only flaw is that it is clearly just a collection of the ongoing comic, so that as is so often the case, there is no conclusion to the story arc, even of the “wrapping things up leaving room for a sequel” kind that you’d find in the first book of a regular prose series. *Should you ever wish to be both amused and plagued with a sense of inadequacy, by all means read one of these manuals, as I did in high school. A Girl Scout will always have a needle with her and be able to fix any rips in her clothing on the spot with a thread pulled out of her hem! A Girl Scout knows the value of spending time with Nature, and is up in time to enjoy the sunrise, as well as knowing her constellations! This entry was posted in Books and tagged teen fantasy, teen graphic novels, youth fantasy, youth graphic novels. Bookmark the permalink.